The types of beneficial fungi that associate with tree roots can alter the fate of a patch of tropical forest, boosting plant diversity or, conversely, giving one tree species a distinct advantage over many others, researchers report. Their study, reported in the journal Ecology Letters, sought to explain a baffling phenomenon in some tropical forests: Small patches of “monodominant forest,” where one species makes up more than 60 percent of the trees, form islands of low diversity in the otherwise highly diverse tropical forest growing all around them. The new study focused on mountain forests in Panama that harbor hundreds of tree species, but which include small patches dominated by the tree species Oreomunnea mexicana. That doesn’t happen often in tropical forests, however, he said. Diversity remains high, and patches dominated by a single species are rare. Understanding how monodominant forests arise and persist could help explain how tropical forests otherwise maintain their remarkable diversity, he said. The researchers focused on two types of fungi that form symbiotic relationships with trees: arbuscular mycorrhizas and ectomycorrhizas. Arbuscular mycorrhizas grow inside the roots of many different tree species, supplying phosphorous to their tree hosts. Ectomycorrhizas grow on the surface of tree roots and draw nitrogen from the soil, some of which they exchange for sugars from the trees. Ectomycorrhizas cooperate with only a few tree species – 6 percent or less of those that grow in tropical forests. 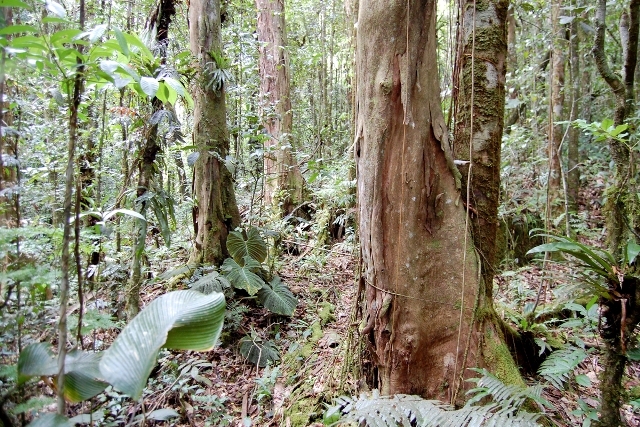 Previous studies found that arbuscular mycorrhizas commonly occur in the most diverse tropical forests, while ectomycorrhizal fungi dominate low-diversity patches. “When you walk in a patch of forest where 70 percent of the trees belong to a single species that also happens to be an ectomycorrhizal-associated tree, it makes you think there is something going on with the fungi that could be mediating the formation of these monodominant forests,” Corrales said. The researchers tested three hypotheses to explain the high abundance of Oreomunnea. First, they tested the idea that Oreomunnea trees are better able to resist species-specific pathogens than trees growing in more diverse forest areas. The researchers next tested whether mature Oreomunnea trees supported nearby Oreomunnea seedlings by sending sugars to them via a shared network of ectomycorrhizal fungi. But they found no evidence of cooperation between the trees. “The seedlings that were isolated from the ectomycorrhizas of other Oreomunnea trees grew better than those that were in contact with the fungi from other trees of the same species,” Corrales said. In a third set of experiments, the team looked at the availability of nitrogen inside and outside the Oreomunnea patches. “We saw that inorganic nitrogen was much higher outside than inside the patches,” Corrales said. Tree species that normally grow outside the patches did well on the high-nitrogen soils, but suffered when transplanted inside the Oreomunnea patches. A look at the nitrogen isotopes in the fungi, soils and in the seedlings’ leaves revealed the underlying mechanism by which the fungi influenced the species growing inside and outside the Oreomunnea patches. The team found evidence consistent with ectomycorrhizal uptake of nitrogen directly from decomposing material in the soil. These fungi make some of their nitrogen available to the Oreomunnea trees while starving other plants and soil microbes of this essential nutrient, Corrales said. The lack of adequate nitrogen means bacteria and fungi are unable to break down organic matter in the soil, causing most other trees to suffer because they depend on the nitrogen supplied by microbial decomposers, she said. Researchers have found recently that similar processes can occur in temperate forests, but this is the first study to link this process to tropical forest monodominance, Dalling said.